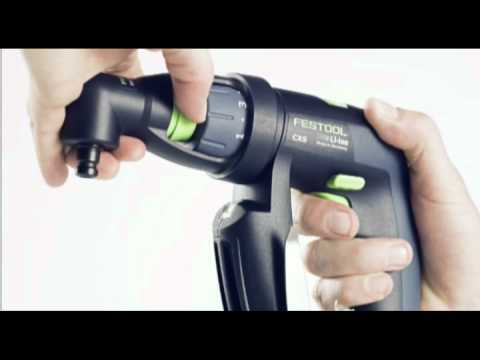 Festool posted a teaser video on youtube of their new CXS Ultra Compact Cordless Lithium-ion Drill. The drill is expected to be released this May (the month of my birth *hint hint*) and will be powered by a 10.8 volt 1.3Ah battery that can be charged in 20 minutes. Festool didn't share very much in the way of specs, but the dill is already for sale in Europe and specs are probably the same. The CXS has a 2-speed transmission that gives us speeds at 0-400/0-1200 RPMs. The drill can be purchased as a standalone kit with a hex chuck, or as a kit that includes the hex chuck, a drill chuck, and a right angle chuck. No word on pricing. Festool also posted a video of a new Workcenter attachment (WCR 1000) for their dust extractors. The WCR 1000 attaches to the top of the extractors and adds additional shelving, storage, and organization options. It will cost you $350 and includes one peg hook tray, one universal double hook, one double hook tool rest, one pivoting storage tray and six peg hooks. Kind of makes me wish Festool made a just a standard work cart. The Workcenter WCR 1000 will help you organize and arrange your workplace more effectively and provides a convenient way to keep the tools you are working with at hand, without getting in your way. The Workcenter can be mounted easily to almost any Festool dust extractor which allows it to be moved freely about the shop or jobsite. Adjustable height columns allow for the storage of several Systainers as well as placing tools at a convenient height (adjusts between 21-15/32 inches and 30-29/32 inches in height). With many options for hanging a variety of hand tools and power tools, the Workcenter provides a flexible, portable, and convenient way to organize your workspace for greater efficiency. Includes one peghook tray, one universal double hook, one double hook tool rest, one pivoting storage tray and six peg hooks. Compatible with Festool CT 22/33/26/36/48 models.